Moles | Pest Control Omaha - Exterminator | Omaha Pest Control, Inc.
tiny or invisible ears and eyes; reduced hindlimbs; and short, powerful forelimbs with large paws for digging. and thousands of other unwanted pests. Moles have been found to tolerate higher levels of carbon dioxide than other mammals, because their blood cells have special and unique hemoglobin protein. Moles are able to reuse the oxygen inhaled when aboveground, and as a result, are able to survive in low-oxygen environments such as underground burrows. 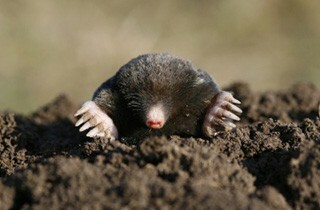 Moles burrow lawns, raising molehills, and killing the lawn, for which they are sometimes considered pests. They can undermine plant roots, indirectly causing damage or death. However, contrary to popular belief, moles do not eat plant roots. Why Do I Have Moles? A mole’s primary diet consists of earthworms, grubs, and other invertebrates found in the soil. Our yards are full of the food sources they are looking for. Moles are a difficult pest to deter and that is why Omaha Pest Control’s mole solutions program includes a thorough inspection and highly effective control methods, as well as active monitoring. Moles are generally not a pest many people have success eradicating on their own. Pesticides can be harmful to people and pets if they are misused or mixed improperly and if you treat too much you may kill earthworms and other beneficial creatures. Give us a call for a free estimate at (402) 250-0425. How Much Does It Cost And How Soon Can You Get Here? Pricing for our Mole Control Program depends on the square footage of the area being treated as well as the severity of the mole infestation. Sign up for a Free quote today and see how much you can save with Omaha Pest Control.